4 Bedroom Semi Detached House For Sale in Clacton-on-Sea for Asking Price £300,000. 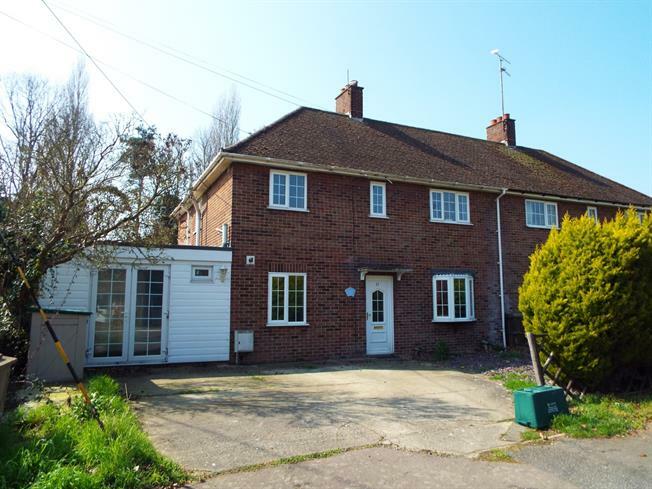 Bairstow Eves are pleased to offer for sale this versatile four/five bedroom semi detached house located within the popular village of Weeley. The property gives you great access for A133 and is within close proximity of local amenities. The property features lounge, dining room, kitchen, Utility room, gym room, downstairs W/C, en-suite shower room, family bathroom, off road parking and enclosed rear garden. The property is in good decorative order throughout (in our opinion) so please call to arrange your viewing. Double glazed uPVC window facing the front. Radiator, carpeted flooring, built-in storage cupboard. UPVC patio double glazed door, opening onto the garden. Radiator, laminate flooring. Double aspect double glazed uPVC windows facing the rear and side overlooking the garden. Tiled flooring. Fitted units, single sink and with mixer tap with drainer, integrated oven, integrated hob, over hob extractor. Double glazed uPVC window facing the side. Radiator, tiled flooring. UPVC patio double glazed door, opening onto the patio. Radiator, tiled flooring. Fitted units, stainless steel sink and with mixer tap. Radiator, tiled flooring. Low level WC, wall-mounted sink. Double glazed uPVC window facing the rear overlooking the garden. Radiator, carpeted flooring, spotlights. Double glazed uPVC window with obscure glass facing the side. Tiled flooring, tiled walls, spotlights. Low level WC, walk-in shower, top-mounted sink. Double glazed uPVC window facing the rear overlooking the garden. Radiator, carpeted flooring, built-in storage cupboard. Double glazed uPVC window with obscure glass facing the front. Heated towel rail, tiled flooring, built-in storage cupboard, tiled walls. Low level WC, panelled bath with mixer tap, shower over bath, top-mounted sink with mixer tap.